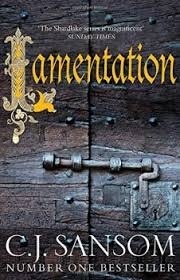 Having already read Dissolution, Dark Fire, Sovereign, Revelation and Heartstone by C.J.Sansom I would like to read Lamentation. It begins during Summer, 1546 with king Henry VIII slowly, painfully dying. His Protestant and Catholic councillors are engaged in a final and decisive power struggle for control the government of Henry’s successor, eight-year-old Prince Edward. As heretics are hunted across London, and the radical Protestant Anne Askew is burned at the stake, the Catholic party focus their attack on Henry’s sixth wife, Matthew Shardlake’s old mentor, Queen Catherine Parr. Shardlake, still haunted by events aboard the warship Mary Rose the year before, is working on the Cotterstoke Will case, a savage dispute between rival siblings. Then, unexpectedly, he is summoned to Whitehall Palace and asked to help the now beleaguered and desperate Queen Catherine Parr who reveals that she has secretly written a confessional book, Lamentation of a Sinner, so radically Protestant that if it came to the King’s attention it could bring both her and her sympathizers crashing down. But, although the book was kept secret and hidden inside a locked chest in the Queen’s private chamber, it has inexplicably vanished. Only one page has been found, clutched in the hand of a murdered London printer. Shardlake’s investigations take him and his associate Jack Barack him from the backstreet printshops of London to the dark and labyrinthine world of the politics of the royal court and the world of intrigue inside Whitehall Palace, among Catholics and Protestants. The theft of Queen Catherine’s book proves to be somehow connected to the terrible death of Anne Askew and the Cotterstoke litigants and Shardlake realises that he himself could end up on a stake. I would like to read The Thomas Berryman Number, the Edgar Award Winning debut novel by James Patterson. It is a civil Rights era Murder Mystery which begins in 1962 with three terrifying murders in the American South, Including the assassination of Jimmie Lee Horn, the mayor of Nashville. A reporter, named Ochs Jones, is sent to investigate and learns of an assassin named Thomas Berryman. Then Ochs, sees news footage of a chap named Bert Poole apparently killing Horn. However a mental patient named Ben Toy claims that Poole is innocent and tells him that a man named Berryman was hired by a Southerner to kill Jimmie Lee Horn. So Ochs then goes to New York to investigate Berryman and finds incriminating evidence connecting him to a corrupt Lawyer in the employ of Johnboy Terrell, an ex-governor of Tennessee. Ochs continues his investigation by speaking with Oona Quinn, Berryman’s girlfriend and soon finds himself in the middle of a deadly conspiracy involving involving Horn, Poole, Berryman and Terrell. Then he learns of another killer named Joe Cubbah who was sent to cover the whole thing up. Cubbah misses Berryman once but does shoot Poole and later catches up with Berryman again with deadly consequences for Johnboy Terrell…. World Space Week’ takes place annually from October 4 to October 10 in most of the world, to commemorate the launch of the first man made satellite Sputnik 1 on 4 October 1957 . It is officially defined as “an international celebration of science and technology, and their contribution to the betterment of the human condition.” On December 6, 1999, The United Nations General Assembly declared World Space Week as an annual event celebration . The choice of dates was based on recognition of two important dates in space history: the launch of the first human-made Earth satellite, Sputnik 1, on October 4, 1957; and the signing of the Outer Space Treaty on October 10, 1967. Best known for his silent slapstick films, the American comic actor, filmmaker, producer and writer Joseph Frank “Buster” Keaton was born October 4, 1895 . At the age of three, Keaton began performing with his parents in The Three Keatons. He first appeared on stage in 1899 in Wilmington, Delaware. The act was mainly a comedy sketch. Myra played the saxophone to one side, while Joe and Buster performed on center stage. The young Keaton would goad his father by disobeying him, and the elder Keaton would respond by throwing him against the scenery, into the orchestra pit, or even into the audience. A suitcase handle was sewn into Keaton’s clothing to aid with the constant tossing. The act evolved as Keaton learned to take trick falls safely; he was rarely injured or bruised on stage. In February 1917, Keaton met Roscoe “Fatty” Arbuckle at the Talmadge Studios in New York City. During his first meeting with Arbuckle, he asked to borrow one of the cameras to get a feel for how it worked. He took the camera back to his hotel room, dismantled and reassembled it. With this rough understanding of the mechanics of the moving pictures, he returned the next day, camera in hand, asking for work. He was hired as a co-star and gag man, making his first appearance in The Butcher Boy. Keaton later claimed that he was soon Arbuckle’s second director and his entire gag department. Keaton and Arbuckle became close friends. In 1920, The Saphead was released, in which Keaton had his first starring role in a full-length feature. It was based on a successful play,The New Henrietta, which had already been filmed once, under the title The Lamb, with Douglas Fairbanks playing the lead. Fairbanks recommended Keaton to take the role for the remake five years later, since the film was to have a comic slant, His trademark was physical comedy with a consistently stoic, deadpan expression, earning him the nickname “The Great Stone Face”. After Keaton’s successful work with Arbuckle, Schenck gave him his own production unit, Buster Keaton Comedies. He made a series of two-reel comedies, including One Week(1920), The Playhouse (1921), Cops (1922), and The Electric House (1922). Keaton then moved to full-length features. A scene fromSteamboat Bill Jr. required Keaton to run into the shot and stand still on a particular spot. Then, the facade of a two-story building toppled forward on top of Keaton. Keaton’s character emerged unscathed, thanks to a single open window. The stunt required precision, because the prop house weighed two tons, and the window only offered a few inches of clearance around Keaton’s body. Aside from Steamboat Bill Jr. (1928), Keaton’s most enduring feature-length films include Our Hospitality (1923), The Navigator (1924),Sherlock Jr. (1924), Seven Chances (1925), The Cameraman (1928), and The General (1927), which is set during the American Civil War, and is based on a real incident. The film combines physical comedy with Keaton’s love of trains, and including an epic locomotive chase through picturesque locations and is regarded as one of Keaton’s greatest films. Aside from Steamboat Bill Jr. (1928), Keaton’s most enduring feature-length films include Our Hospitality (1923), The Navigator (1924),Sherlock Jr. (1924), Seven Chances (1925), The Cameraman (1928). One of his most biting parodies The Frozen North (1922), is a satirical take on William S. Hart’s Western melodramas, like Hell’s Hinges (1916) and The Narrow Trail (1917). In The Playhouse (1921), he parodied his contemporary Thomas H. Ince, Hart’s producer, who indulged in over-crediting himself in his film productions. The short also featured the impression of a performing monkey which was likely derived from a co-biller’s act (calledPeter the Great). Three Ages (1923), Keaton’s first feature film, is a parody of D. W. Griffith’s Intolerance (1916), from which it replicates the three inter-cut shorts structure. Keaton signed with MGM in 1928, a business decision that he later regretted Because the studio system MGM represented severely limited his creative input. Keaton was so depleted during the production of 1933’s What! No Beer? that MGM fired him after the filming was complete, despite the film being a resounding hit. In 1934, Keaton accepted an offer to make an independent film in Paris, Le Roi des Champs-Élysées. During this period, he made one other film in Europe, The Invader (released in America as An Old Spanish Custom in 1936). Upon Keaton’s return to Hollywood, he made a screen comeback in a series of 16 two-reel comedies for Educational Pictures. Most of these are simple visual comedies, with many of the gags supplied by Keaton himself, often recycling ideas from his family vaudeville act and his earlier films. The high point in the Educational series is Grand Slam Opera, featuring Buster in his own screenplay as an amateur-hour contestant. When the series lapsed in 1937, Keaton returned to MGM as a gag writer, including the Marx Brothers films, A Night at the Opera, (which included developing the famous crowded stateroom scene. At the Circus (1939) and Go West(1940), and providing material for Red Skelton. He also helped and advised Lucille Ball in her comedic work in films and television. In 1939, Keaton starred in ten two-reel comedies, Pest from the West, a shorter, tighter remake of Keaton’s little-viewed 1935 feature The Invader; The final entry was She’s Oil Mine, and Keaton swore he would never again “make another crummy two-reeler. However, his career recovered in the 1940s, remarried and successfully revived his career to a degree as an honored comic performer. Keaton played character roles in both “A” and “B” features. He made his last starring feature Boom in the Moon (1946) in Mexico; the film was a low budget production, and it was not seen in the United States until its release on VHS in the 1980s. Critics rediscovered Keaton in 1949 and producers occasionally hired him for bigger “prestige” pictures. He had cameos in such films as In the Good Old Summertime (1949), Sunset Boulevard (1950), and Around the World in Eighty Days (1956). Keaton also appeared in a comedy routine about two inept stage musicians in Charlie Chaplin’s Limelight (1952), recalling the vaudeville of The Playhouse. He was a non-speaking card player in Sunset Blvd. (1950), providing additional weight to the silent era echoes of the movie.